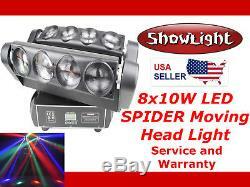 SHOWLIGHT LED SPIDER Moving Head Light. Brand New ShowLight CREE RGBW LED 8x10W 4in1 SPIDER Moving Head Wash Light SPIDER Light, with double row and four heads, for strong bar entertainment Superior beam effect and flexible swing rotation This unit offers eight default pixel macro function to create amazing from slow to fast water effects Ultra smooth 145° vertical rotation Simple and portable system, suitable for bar, DJ, night clubs, small concerts, stage, and so on. SPECIFICATIONS Input Voltage: AC90-240V, 50/60Hz Power Consumption: 100W LED Quantity: 2pcs Red, 2pcs Green, 2pcs Blue, 2pcs White LED Control Signal: DMX 512, Master-slave, Sound, Auto Control Channels: 1CH/6CH/12CH international DMX512 channel Net Weight: 12.13 lbs Gross Weight: 13.23 lbs Product Size: 17.32x9.25x5.9 in Packing Size: 18.5(L)x12.60(W)x9.65(H)in Outer Box Size: 20.67(L)x19.29(W)x13.78(H)in (2-in-1) PACKING LIST Led moving head light 1pcs Power Cable 1pcs XLR connector 1unit Light Hook 1pcs User Manual 1pcs. DMX Function For details on DMX channels and functions, please check the USER MANUAL. 14 Channel mode: CH1 Pan 0-255 CH2 Tilt 1 0-255 CH3 Tilt 2 0-255 CH4 Pan fine Main dimming 0-255 CH5 Tilt 1 Fine 0-255 CH6 Tilt 2 Fine 0-255 CH7 Motor speed 0-255 CH8 Main dimming 0-255 CH9 Strobe 0-255 CH10 Dimming CH11 The LED bulb control: 0-9 All ON. 220-250 L8 ON CH12 Macro: 0-10 No function. DMX address is more than 10, each add 20 will be a macro function CH13 Macro speed 0-255 from fast to slowly CH14 Sound and Automatic control: 0-64 No function. Each functional delay for 10 seconds 20 Channel mode: CH1 Pan 0-255 CH2 Tilt 1 0-255 CH3 Tilt 2 0-255 CH4 Pan fine Main dimming 0-255 CH5 Tilt 1 Fine 0-255 CH6 Tilt 2 Fine 0-255 CH7 Motor speed 0-255 CH8 Main dimming 0-255 CH9 Strobe 0-255 CH10 L1 Dimming 0-255 CH11 L2 Dimming 0-255 CH12 L3 Dimming 0-255 CH13 L4 Dimming 0-255 CH14 L5Dimming 0-255 CH15 L6Dimming 0-255 CH16 L7 Dimming 0-255 CH17 L8 Dimming 0-255 CH18 Macro: 0-10 No function. DMX address is more than 10, each add 20 will be a macro function CH19 Macro speed 0-255 from fast to slowly CH20 Sound and Automatic control: 0-64 No function. Each functional delay for 10 seconds. We will do everything possible to correct any problems and answer all of your questions, but we can not be responsible for potential buyers not verifying their application. Feedback will be left promptly after you have received your item(s), are satisfied, and have left feedback for us. The item "ShowLight CREE RGBW LED 8x10W 4in1 SPIDER Moving Head Stage Light with rotation" is in sale since Monday, November 12, 2018. 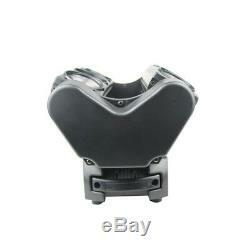 This item is in the category "Musical Instruments & Gear\Stage Lighting & Effects\Stage Lighting\ Single Units". The seller is "prosoundrock" and is located in Cerritos, California. This item can be shipped worldwide.